The Motorola Moto X Style offers good image and video quality across the board. In very low light optical image stabilization could help reduce the need for shooting at high ISOs but but even without such a system digital stabilization is doing a very good job in video mode and still images show well balanced processing up to the highest sensitivities. The front camera is one of the first we have seen to come with a dedicated LED-flash, giving the Moto an advantage when shooting self-portraits in very low light. Images are composed and viewed on a large high-resolution display that is sharp and bright, allowing for decent visibility even when shooting in sunny conditions. All the technology is wrapped up in a solidly built water repellent body, allowing for limited use in adverse weather conditions. On the software side of things, purists will appreciate the Moto X Style's operating system, which is very close to stock Android. Despite the latest version of Google's mobile operating system the Moto X Style does not support DNG Raw capture or full manual control over shutter speed and ISO though. Panorama mode cannot keep up with the best in class but if you are happy to expand the imaging feature set via third-party options from Google Play and can live without Raw, the Motorola Moto X Style currently represents one of the best value for money handsets for mobile photographers in the high-end bracket of the market. In terms of camera operation, like its predecessors the Moto X Style is clearly focused on simplicity and ease of use and this will no doubt work well for some users. Those who want more control over the shooting process get a taste of it via the focus target with its integrated exposure compensation slider but other than that the native camera app does not offer any shooting parameters nor a particularly comprehensive imaging feature set. HDR and panorama modes are on board but aren't particularly impressive compared to the equivalent modes on some competitors.The new Night Mode can be useful in some situations but those looking for better manual control or special features are arguably better off picking their favorite camera and specialist apps from the Google Play Store. The Motorola Moto X Style images show good exposure and color across the ISO range and in bright light its 21MP sensor captures among the best detail of all current smartphones. Images are clean of artifacts, with low noise-levels and good sharpness. The only point of criticism in high-contrast conditions is a tendency to clip highlights. However, exposing for the highlights using the focus and exposure target or dialing in some negative exposure compensation usually solves the issue. Engaging HDR mode is another option. In lower light the Motorola maintains a good balance between image detail and noise reduction up to the highest ISOs. However, the lack of optical image stabilization means that in very dark conditions the Moto has to resort to higher ISO values than competing devices that offer this feature in order to avoid blur through camera shake. That said, the Motorola's image output size is very large and downsized to typical online-use or screen-sized viewing even images taken at the highest sensitivities are more than usable. In terms of color and tonality the X Style's video output is very close to the still images and digital image stabilization does a very good job of keeping things smooth and stable. The Motorola Moto X Style offers class-leading image detail in bright light and good camera performance combined with an almost pure Android OS, responsive operation and a weather-resistant body.It's also currently a good deal less expensive than many of its direct rivals, making it an obvious recommendation for any mobile photographer looking for large device with high-end specs and performance that doesn't break the bank. With 83 points, at the time of writing the Motorola Moto X Style occupies the number six spot in the DxOMark smartphone rankings, slotting in right behind the Samsung Galaxy Note 4 and in front of the Sony Xperia Z3+. The DxOMark team found images from Moto X Style show very good detail in bright light, with good exposure and white balance. Additionally the autofocus worked reliably in all light conditions. However, some flash images can be over-exposed and highlight clipping can be visible in high-contrast scenes. Detail in video mode is equally good and the testers were impressed by the Moto Style's video stabilization and fast white balance and exposure adaptation. However, noise creeps in when recording in lower light. For a more detailed analysis, visit www.dxomark.com. 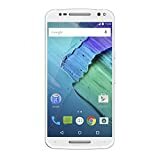 The Motorola Moto X Style offers good image and video quality across all lighting situations and the large QHD-display is a pleasure to view and compose images on. A front flash helps when taking self-portraits in low light and a weatherproof body lets you shoot in adverse weather conditions. There's no support for Raw capture or full manual control over shutter speed, nor can the panorama mode compete with its Samsung and Apple equivalents. However, if you can live with these limitations, at its current pricepoint the Motorola is an easy recommendation. There are 42 images in our Motorola Moto X Style samples gallery. Please do not reproduce any of these images on a website or any newsletter / magazine without prior permission (see our copyright page). We make the originals available for private users to download to their own machines for personal examination or printing (in conjunction with this review), we do so in good faith, please don't abuse it.